Michael Scot was a Durham man, who applied himself to the abstruse Aristotelian philosophy, which he pretended to translate from Avicenna, and dedicated to Frederic II. emperor of Germany, whose astrologer he was. Some of his philological and astrological works have been printed, and Dempster says some remained in his time in Scotland, which his countrymen would not dare to open for fear of the devilish pranks that might be played by them. Circle, buildings, towers, with a cross; the first word upright, the second italic. Cistercian Abbey now Parish Church. Founded 1150 with early C16 addition and alterations dated 1730; 1884-5 vestry and 1913 restoration; 1973 ambulatory. 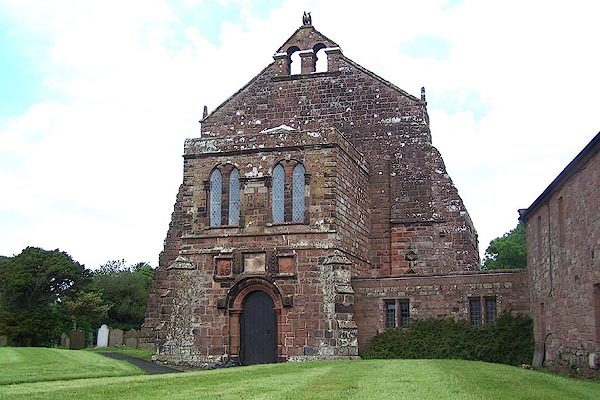 Large blocks of red sandstone (brought across the Solway from Scotland). Graduated greenslate roof, Welsh slate on patch and vestry. 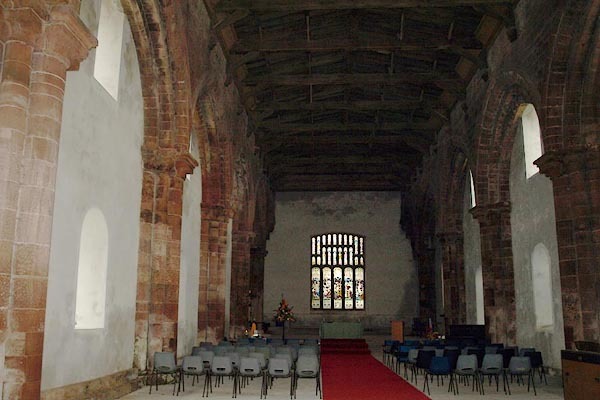 West porch and ambulatory extension; 6-bay nave/chancel, formerly the nave of the Abbey Church (originally of 9 bays) with aisles removed; west twin bellcote and north vestry/organ chamber. 2-storey porch has round arch with Latin inscription to Robert Chambers, Abbot 1507 and his coat of arms. Upper floor rebuilt to form vestry, dated 1730 with Latin inscription. 2-light lancet windows flank inscription. Flanking statue recesses of 1507 appearance; the right one has door giving access to small chamber. Ambulatory to right, linking with adjoining library and shop, has lead-paned windows in chamfered surrounds. Side walls of nave of 1730 have round-headed casement windows with glazing bars on 2 levels. West wall projects at either side and has been stepped to give the appearance of buttresses. Perpendicular east window c1604, moved to its present location in 1730, flanked by former nave aisle columns. Interior of porch and ambulatory have graveslabs to various abbots and members of the Chambers family of Raby Cote. Heavily moulded west portal with 4 orders of shaft columns and enriched waterleaf capitals. Interior: arcades have piers of clustered columns, with waterleaf capitals, and pointed arches now blocked to form north and south walls. Pre-reformation open timber roof moved to a lower level in c1604. Restoration dated MCMXIII on corbel. Norman gallery at west end now gives access to former vestry. Royal Arms of Queen Victoria. Free-standing bust of Joseph Saul by Joshua Anderson. Jacobean carved oak chair and 2 C15 or early C16 oak muniment chests. C20 furnishings and fittings. Late C19 and early C20 stained glass. After the Dissolution the Abbey was granted to Oxford University. See G.E. 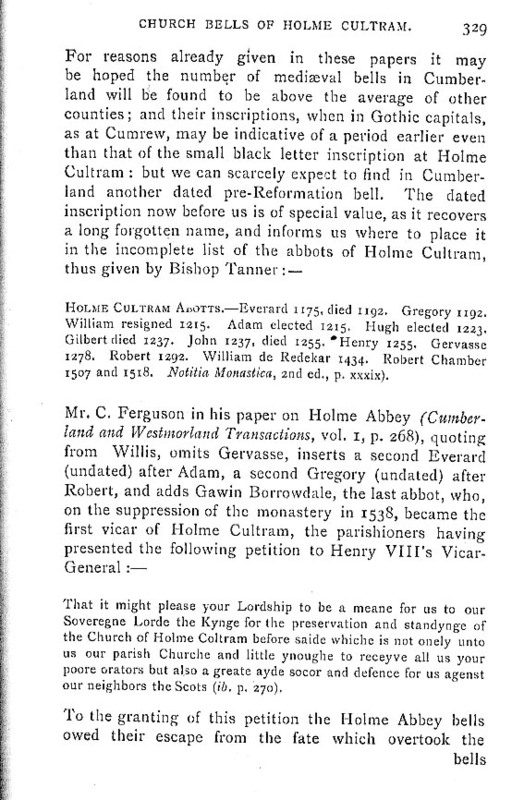 Gilbanks, Some Records of A Cistercian Abbey/Holme Cultram, Cumberlands, 1899; F. Grainger and W.G. 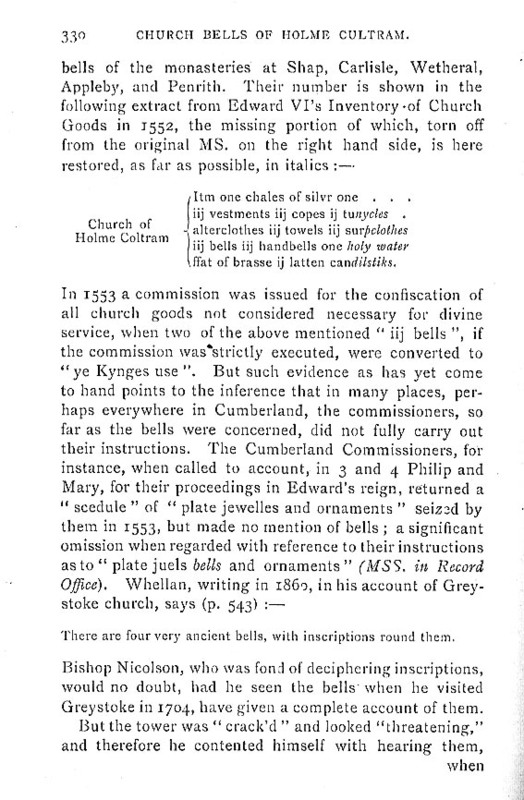 Collingwood, The Register & Records of Holme Cultram, 1929; Transactions Cumberland & Westmorland Antiquarian & Archaenlogical Society, old series, i, p263; new series, vii, pp262-268; xiii, pp244-251. Churchyard wall. C20 on medieval plinth. Squared blocks of red sandstone. Low wall, unfinished, built on the site of the south aisle wall of the former Abbey of Holme Cultram, incorporating the excavated foundations of the cloister entrance. West end incorporates plinth of south-west angle of nave. Painting, watercolour, Holm Cultram Abbey; West Door, Abbey Town, Holme Abbey, Cumberland, by William Henry Nutter, 1830s-40s. View into the abbey interior through the double west door, the doorway of which is framed by a substantial round headed arch supported by eight columns. Set of prints, engravings, The Castles, Abbeys, and Priories of the County of Cumberland, by Samuel and Nathaniel Buck, 1739, reprinted by Hudson Scott and Sons, Carlisle, Cumberland, 1837 and 1877. Print, uncoloured engraving, The South East View of Holme-Cultram Abby, in the County of Cumberland, drawn and engraved by Samuel and Nathaniel Buck, 1739, reprinted by Hudson Scott and Sons, Carlisle, Cumberland, 1877. 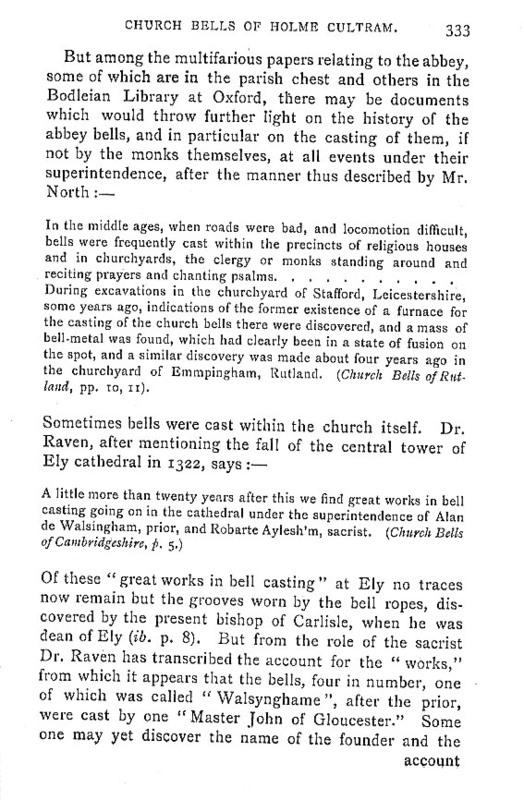 With descriptive text of 1837. 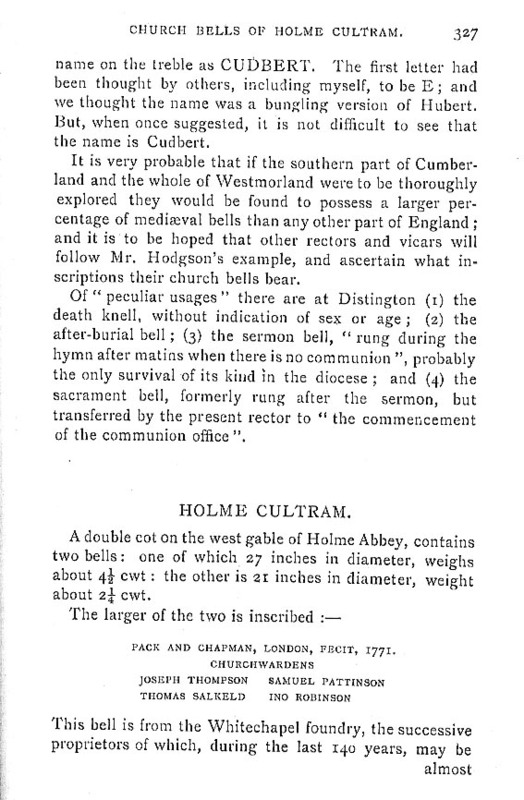 No.17 in The Castles, Abbeys, and Priories of the County of Cumberland, 1877. THE SOUTH-EAST VIEW OF HOLME-CULTRAM ABBY, IN THE COUNTY OF CUMBERLAND. 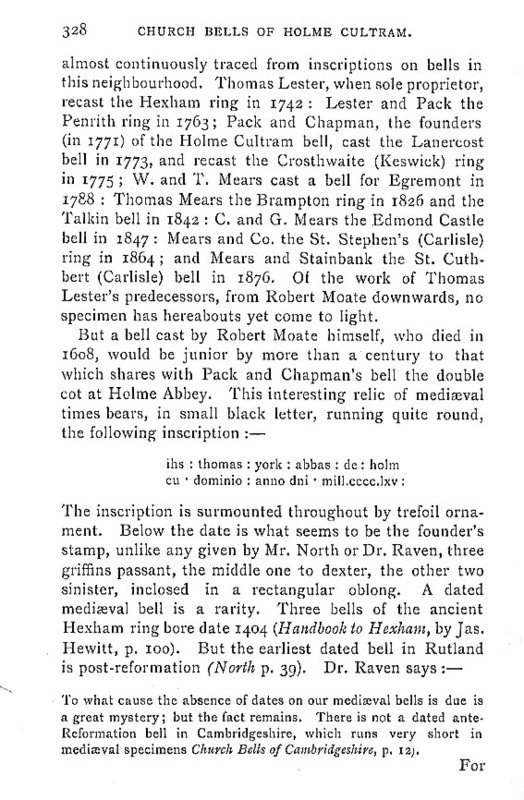 To Edawrd Stephenson Esqr: This Prospect is humbly Inscribed by his most Oblig'd Servants Saml: & Nathl: Buck. THIS Abby of Cistercians was founded according to Dugdale by K. Hen. II. 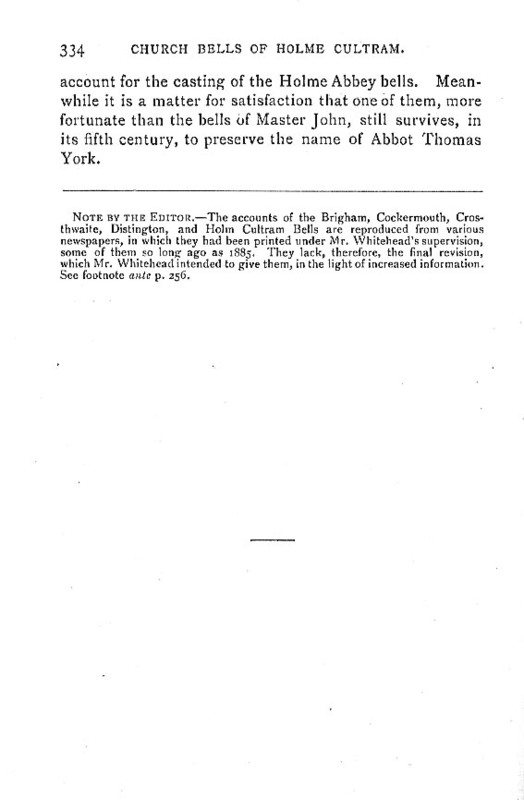 AD 1150, but according to Speed and others by Henry Earl of Carlisle and Huntingdon, Son of David K. of Scots, who gave it all the Lands of Holme Cultram. It was dedicated to the Blessed Virgin. K. Hen. III K. Rich. I. and K. John, with divers other Nobles and Gentlemen, were Benefactors. John Gournon and Margaret his Wife founded and endow'd a Chantry in this Abby Church for four Chaplains Monks of this House and Two secular Chaplains. It is now a Parochial Church. 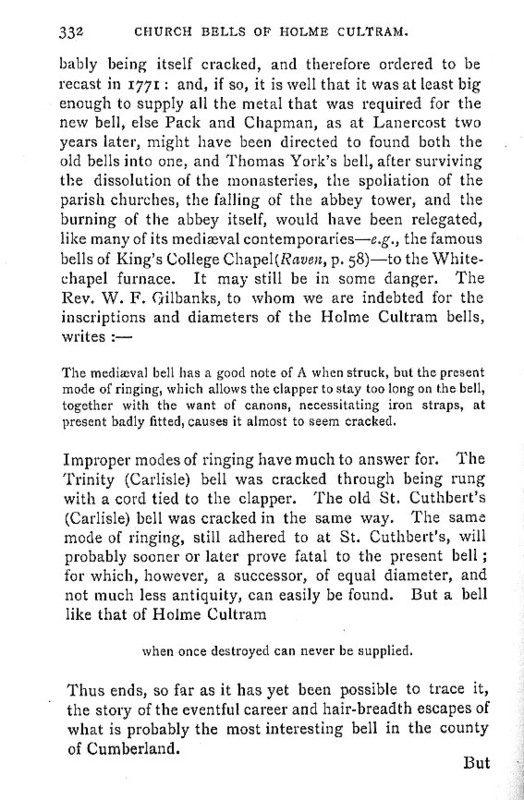 The Impropriator is the University of Oxford, by the Grant of Q. Mary. An. Val. L427: 19s: 3d. Dugdale. L535: 3s: 7d. Speed. Saml. & Nathl. Buck delin: et sculp: Publish'd according to Act of Parliament March 26. 1739. 5 cross slab grave covers. 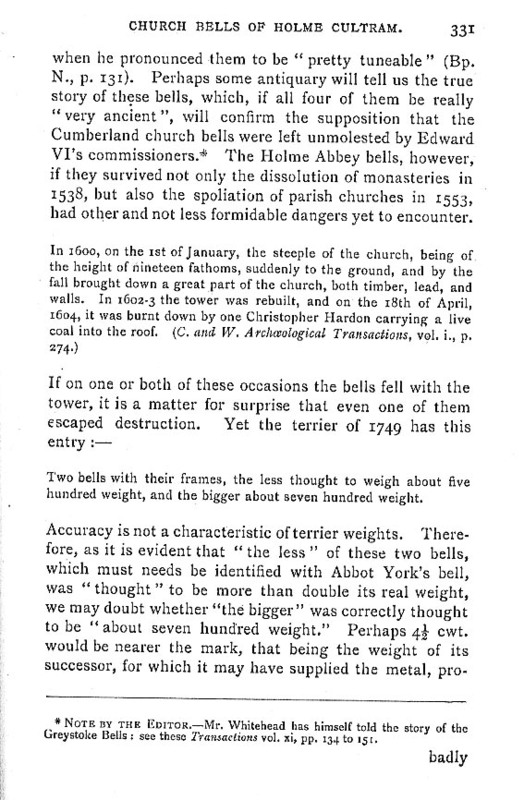 hearsay The abbey was a 'granddaughter house' of Rievaulx Abbey. hearsay Michael Scot might have been born in Cumbria. He was a wizard, astrologer, philosopher, and spent his last years here. He had been educated at Oxford, Paris, Salamanca and Toledo; spoke Hebrew and Arabic; was an adept in medicine and chemistry. He lived in Florence and Padua; is mentioned by Boccacio and by Dante. He was astrologer to Frederick II, Holy Roman Emperor; and was knighted by Alexander III King of Scotland.